Image caption Protesters at Westminster Abbey said The Church Commissioners "needed to take more care of communities"
Campaigners against plans to build an out-of-town retail park on Church of England-owned land have been protesting outside Westminster Abbey. Councillors backed proposals for the scheme on a plot owned by The Church Commissioners in Grovebury Road, Leighton Buzzard, last year. 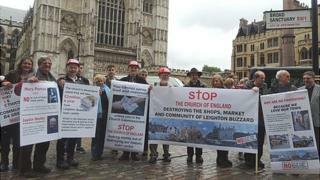 Protesters said the church "should not be making money from destroying our precious town centre". A Church Commissioners' spokesman said they took their obligations seriously. The scheme, which includes a DIY unit, four other shops and a restaurant, was approved by Central Bedfordshire Council in February 2013. But Friends of the Earth campaign coordinator Victoria Harvey believes it will lead to a "dead town centre which harms the community". She said the plans "do not not provide anything new" but would "take a minimum of £2m in trade" from the town centre. An application for a judicial review on these grounds was turned down and Ms Harvey has now gone to the Court of Appeal. The London protest was to "put pressure on The Church Commissioners", Ms Harvey said. "We are hoping the church takes its commitment to be sensitive to communities seriously and changes its mind," she added. Church Commissioners, which raise money through an investment portfolio, said they respected the right to "stage a peaceful protest" but the planning and legal processes had been "thorough". "The commissioners always take into account local interest and planning regulations and take seriously their obligation and right under the Charities Act to seek the best price possible while selling land or buildings," a spokesman said. "The proposed development will .... provide a much-needed facility for the town, attract new inward investment and create a large number of jobs for local people." Central Bedfordshire Council said "stringent" planning restrictions "strictly limited the kind of shops that can be opened there".